Days of Our Lives (DOOL) spoilers tease that Steve (Stephen Nichols) will continue to battle strange symptoms. He just won’t understand what’s going on. Steve’s experiencing severe dizzy spells along with blurry vision. He’ll hope it’s nothing serious, but his fears will steadily grow. Fortunately, Steve will come clean to Kayla (Mary Beth Evans) soon. She’ll give him a checkup, but she won’t find anything abnormal. Days of Our Lives spoilers say Steve is actually being poisoned, but who’s to blame? DOOL fans can expect it to be someone quite shocking. The big reveal’s coming up and we’ve got the scoop on the culprit. It turns out John’s (Drake Hogestyn) behind Steve’s suffering. Wait…what?! Yes, you read that correctly. 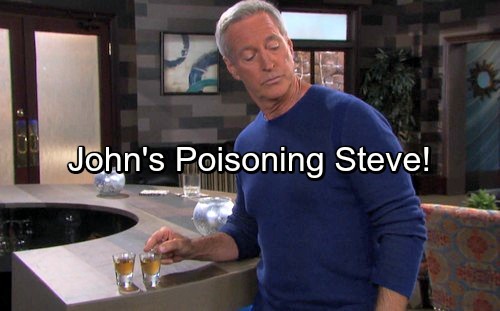 Days of Our Lives spoilers indicate that John’s poisoning Steve. Since Steve and John still seem like great friends, there must be a reasonable explanation. It’s hard to imagine John intentionally harming Steve, but he’ll definitely put something in his drink next week. John will nearly confess everything to Marlena (Marlena Evans) but he’ll ultimately decide against it. He’ll feel like he needs to leave her in the dark for her protection. Is John being blackmailed into this? That’s one possibility to consider. Of course, the show could always take the classic brainwashing route. Mind control is the way to go when you want someone to do something out of character and you need a good reason why. Even though it appears John will battle some guilt, he may not be able to disobey orders. If so, that would open up another mystery. Everyone would wonder who’s using John for this sinister scheme. Whatever the case, John’s indeed causing issues for Steve right now. It should be interesting to see how this hot plot unravels. Steve will eventually realize poison is his problem. Days spoilers state that he’ll try to figure out who’s responsible. Steve’s certainly in for a huge surprise! John will have some explaining to do, so DOOL viewers won’t want to miss the action ahead. Are you looking forward to the rest of this intriguing storyline? Why do you think John is poisoning Steve? We’ll give you updates as other Days news comes in. Stay tuned to the NBC soap and don’t forget to check CDL often for the latest Days of Our Lives spoilers, updates and news.